For a long time, this area of Vegas was rather run down, but the Fremont Street Experience has changed all that! So what is it? Well, basically all the streets here are closed off to traffic and they’ve constructed a giant roof over Fremont Street on which light and picture shows are shown. The roof is made up of 12.5 million LEDs which according to the organisers makes it “the biggest big screen on the planet”. There are a range of different shows to see, on the hour from 6pm until 11pm. We enjoyed them all, but you do get a bit of a stiff neck looking up for so long. To be honest, it’s not just the big screen that makes the atmosphere here so good. There are also two stages with regular live music plus street entertainers and a collection of old neon signs which are exhibits in the Las Vegas Neon Museum. It’s worth popping into the casinos here too as you’ll see familiar names like the Golden Nugget. They’re very different from the huge casino hotels on the strip, but have a certain charm about them. To get downtown, hop on the busses that run up and down the strip or for a quicker journey, hail a cab. 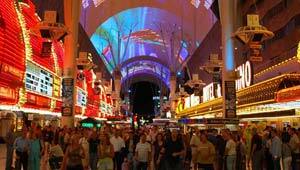 Address: Fremont Street Experience, Fremont Street (off Las Vegas Blvd), Las Vegas, USA.